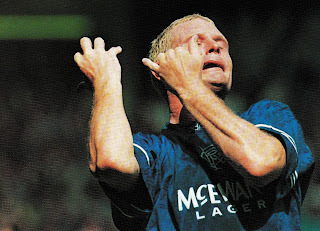 1-Shortly following his transfer, to Rangers Glasgow in the summer of 1995, English Star Paul Gascoigne mocked the Catholic Celtic Glasgow fans by pretending to play a flute (symbol of the Loyalists) during a pre-season summer friendly vs. Steaua Bucharest. He did the same thing during the ‘old firm’ clash with Celtic in January 1998, for which he was internally reprimanded by Rangers. Finally, he did it as a Middlesbrough player in a Testimonial match vs. Rangers for former Rangers teammate Alan McLaren. 2- Early in 1990/91 season, new AS Roma teammates Angelo Peruzzi and Andrea Carnevalle tested positive for Phentermine in a random drugs test after a match on September 23, 1990 (AS Roma 1-Bari 0). They were both banned for a year. The pair claimed that they had taken the pills at family dinner given a family member to suppress headache pain. Years later Peruzzi claimed that another player had given him the medication and there was no family dinner. He was coming back after injury and was advised by the player that this would help his recovery. Peruzzi claims that the Federation advised Roma President Dino Viola to go public with the dinner table version story and the bans would have been about 3 months. But were in fact just waiting for the opportunity to attack Viola and humiliate him in Public. 3- England midfielder David Batty refused a winners’ medal after his club Blackburn Rovers had clinched the EPL title in 1995. He had missed most of the season through injury and felt that he had not earned it. In total he had played only 5 matches. 4- French International Carlos Curbelo of Nancy-Lorraine played for France twice in 1976. However, FIFA banned him after they found out that the Uruguayan born player had already represented Uruguay three times as a Junior in 1971. 5- The original referee, for Brazil’s Friendly vs. West Germany in March 1982, was Portugal’s Antonio Jose da Silva Garrido of Portugal, However the West Germans protested since he spoke the same language as the opponents. Therefore Spanish referee Augusto Lamo Castillo replaced him. -This was the 13th meeting between the nations. -The previous match between the nations, as well as England’s previous victory and the previous match between the Nations in England, was the first leg of this European Championship Qualifier in London’s Wembley Stadium, on November 12, 1986 that England won 2 to 0. England players: Sansom, Butcher, Hoddle, Steven, Lineker and Beardsley and Yugoslavia Players: Ravnic, Zoran Vujovic, Baljic, Elsner, Hadzibegic, Katanec, Jankovic and Zlatko Vujovic also took part in that match. -The previous match between the nations, in the same stadium, was a friendly on June 5, 1974 that ended in a 2 to 2 tie. -The previous match between the nations at a neutral venue, as well as Yugoslavia’s previous win, was during the European Championship Semifinals in Florence, Italy on June 5, 1968, that Yugoslavia won 1 to 0. Yugoslavia Manager Ivica Osim played in that match. -The next match between the nations as well as England’s next win, would be a Frriendly played on December 13, 1989, at London’s Wembley Stadium, that England won 2 to 1. England players: Shilton, Butcher, Robson and Lineker and Yugoslavia Players: Hadzibegic and Stojkovic also took part in that match. Both Managers were still in their posts. Bryan Robson scored twice in that match. Faruk Hadzibegic captained Yugoslavia in that match. -Yugoslavia’s previous win in Belgrade was a friendly on May 11, 1958 that Yugoslavia won 5 to 0. -England won this European Championship qualifying Group to reach the Finals to be played in West Germany in June 1988. The other teams in this group were Yugoslavia, Northern Ireland and Turkey. -This was one of England’s best ever away performances. They scored 4 goals in the first 25 minutes. -This performance made them in the eyes of many observers’ favorites to win the European Championship title, but they performed poorly in the Finals and lost all three matches. After the disastrous Euros, Sansom, Hoddle and Reid were discarded and did not play for England again. -Terry Butcher assumed captaincy after Bryan Robson was substituted. -This was Yugoslavia’s worst defeat since losing 6 to 1 to Scotland in a Friendly on September 12, 1984 at Glasgow. Mirsad Baljic and Fadil Vokrri also took part in that match and Vokrri scored Yugoslavia’s goal. -This was the first time Yugoslavia had conceded 4 goals at home, since tying 4 to 4 with Wales in a European Championship qualifier on December 15, 1982 at Titograd. Faruk Hadzibegic took part in that match. -This was Yugoslavia’s worst home defeat since losing 2 to 4 to USSR in a Friendly on March 23, 1977. -The First goal was scored in the 4th minute after a long punt by Shilton that Hadzibegic and Elsner were hesitant to clear, this allowed Beardsley to score. -In the 16th minute, Ravnic gave away an indirect free kick by picking up the ball twice in the area. Robson passed to Barnes who scored. -In the 20th minute, a corner taken by Steven was headed towards Robson who spinned around and scored. -In the 25th minute, another corner from the right by Barnes was headed in by Adams. This was Adams’ first goal for England. -Mauro Ravnic was replaced at halftime due to injury by Vladan Radaca. This was Ravnic’s last cap for Yugoslavia. This was Vladan Radaca ‘s first cap. -Yugoslavia scored with 10 minutes remaining by Katanec who headed in a corner. This was the first goal England had conceded in the qualifying campaign. -Terry Butcher called this match as one of his most memorable matches ever for England. In the same month playing for his club Rangers vs. Celtic, he was charged with disorderly conduct and breach of peace. He was convicted on April 1988 and paid a fine. -Terry Butcher played for England Manger Bobby Robson at club level at Ipswich. -Yugoslavia’s Marko Elsner had a nightmare of a match and his display was mostly blamed by the press for the disastrous Yugoslavian performance. He was replaced as early as the 29th minute, by Milan jankovic, with England already 4-0 up. Elsner played as libero though he was a midfielder at his club OGC Nice of France. -Marko Elsner was also eventually capped by Slovenia like teammate Srecko Katanec. -West German Manager Franz Beckenbauer was in the audience to spy on potential rivals England. -The day before, England’s Under-21’s also defeated Yugoslavia 5 to 1. -Prior to kickoff, Yugoslavia’s recent World Under-20 Champions were presented to the public. -Before the match started the weather was foggy and referee Michel Vautrot even discussed with the authorities about postponment. However, before the kickoff the mist was clear. -Gary Lineker of Barcelona and Milan jankovic of Real Madrid were rivals in the Spanish La Liga. Jankovic won the League title with Real Madrid that season and then joined Anderlecht for the following season. -Milan Jankovic retired aged just 30 at the end of 1989/90 season with Anderlecht. -Yugoslavia Manager Ivica Osim had managed Zeljeznikar prior to the national team appointment. Baljic and Bazdarevic had played for him at club level. -Dragan Stojkovic was booked in the 75th minute after a push from behind on Robson. -Yugoslavia were missing Davor Jozic who had just joined Italy’s Cesena that season. -This was Fadil Vokrri last match for Yugoslavia, despite scoring 6 goals in 12 matches. -This loss convinced Osim to select more foreign based players for the upcoming World Cup qualifiers. This included players like Paris St Germain’s Safet Susic, who had not been called up since 1984. -John Barnes and Peter Beardsley had just joined Liverpool that season from Watford and Newcastle respectively. They won the League title that season and Barnes was named player of the year. -England’s Gary Lineker of Barcelona and Glenn Hoddle of Monaco were England’s only non-british based players. Hoddle’s Monaco teammate Mark Hateley did not play. Glenn Hoddle won the French League title that season with Monaco. -Trevor Steven also won the French league title with Olympique Marseille in 1992. 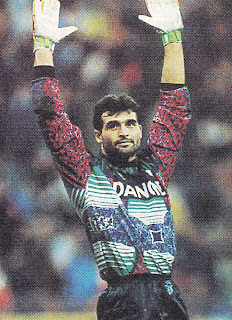 Yugoslavia’s Dragan Stojkovic was French league champion with Olympique Marseille in 1991. -Peter Shilton had joined Derby County that season along with England teammate Mark Wright from Southampton. Wright did not play in this match. -Neil Webb had become England’s 1000th player in history when selected in a September friendly vs. West Germany. -Gary Lineker and Dragan Stojkovic were for a brief time teamamtes at Japan’s Nagoya Grampus 8 in 1994, just before Lineker’s retirement. -Dragan Stojkovic was nicknamed Piksi. He became the Yugoslav Federation President in 2001 and the Red Star Belgrade President in 2005. -Hadzibegic and Bazdarevic were second division players with France’s Sochaux. They earned promotion at the end of that season. -Yugoslavia’s Zoran and Zlatko Vujovic were twins and club teammates at Bordeaux. -Yugoslavia’s Zoran and Zlatko Vujovic, Marko Elsner, Faruk Hadzibegic and Mehmed Bazdarevic were French League players. Dragan Stojkovic and Marko Mlinaric also eventually joined the French League. As mentioned Glenn Hoddle and Trevor Steven also played in the French League. Zlatko Vujovic also played for Paris St Germain, Cannes, Sochaux and OGC Nice among others in the French League. -Glenn Hoddle was England National Team Manager from 1996-99. -Gary M. Stevens joined Terry Butcher at Rangers Glasgow the following season. Everton teamamte Trevor Steven followed a year later. In the fall of 1983, Belgium under Manager Guy Thys had qualified for the European Championships Finals to be held in France in 1984. Belgium were the runner-ups of the previous edition in 1980 and had been present for the 1982 World Cup where they had upset defending Champions Argentina. They were regarded as one of the better European teams with a solid defense whose hallmark was their efficient use of the offside trap. In the previous seasons, top club sides, Anderlecht and Standard Liége, had qualified for European Cup Finals. The backbone of the team was made up of Bayern Munich goalkeeper Jean-Marie Pfaff, Standard’s Eric Gerets and Walter Meeuws in defense, Anderlecht’s Frankie Vercauteren and Rene Vandereycken and Internazionale’s Ludo Coeck in midfield and Club Brugge’s Jan Ceulemans and Anderlecht’s Erwin Vandenbergh as strikers. This team had won a group containing Scotland, Switzerland and East Germany. The Finals Tournament was to be held in neighboring France and many saw Belgium as a good outside bet to do well. However, in the new year (1984) a scandal hit Belgian Football that decimated this squad and turned a potentially successful Tournament into a fiasco. Standard Liége, under Manager Raymond Goethals, had won the Belgian League Title in the previous two seasons (1982 and 1983). Club and National team Captain Eric Gerets led the team, along with other stars such as Walter Meeuws, Gerard Plessers, Guy Vandermissen, Jos Daerden and Dutchmen Arie Haan and Simon Tahamata. They were somewhat off the pace that season (1983/84) as Captain Eric Gerets had joined AC Milan and Arie Haan had joined PSV Eindhoven, but still contained the bulk of their stars. In preparations for the upcoming Finals Belgium were due to play in a friendly match against West Germany on February 29, 1984. It was on the days leading up to this match that the scandal broke to the public. The actual events took place at the end of (1981/82) season. Standard were League leaders with only two points more that rivals Anderlecht going into the last match of the season, on May 8th, 1982, vs., Waterschei. In addition Standard were due to play Barcelona on May 12th for the Cup Winners Cup Final. To insure a win to guarantee the title and no injuries ahead of the Final, Club Administrator Roger Petit along with Manager Raymond Goethals decided to bribe some Waterschei players. Team Captain Eric Gerets was charged with the task of making contact with the opposition. It was not very difficult to make contact, Standard’s Gerard Plessers’ brother Pierre played for Waterschei and was actually neighbors with Gerets. Gerets himself was friends with Waterschei Captain Roland Janssen. Gerets, with the full knowledge of both petit and Goethals, offered to Janssen, the Standard players’ winning bonuses to insure Waterschei’s complicity, the total amounted to 420.000 Belgian Francs. This scandal also referred as ‘Affaire Bellemans, was part of Judge Guy Bellemans’ investigation on slush funds in Professional Soccer in Belgium. On February 22, 1984, Standard’s fiscal as well as Club Administrator, Roger Petit’s records were seized. On February 24, 1984 under questioning, Roger Petit and Raymond Goethals admitted to falsifying records to avoid taxes. The bribe money was discovered in Petit’s records that included a reference ‘Goethals-Genk 50.000/150.000 F’, indicating money at the disposal of Goethals to bribe Waterschei. On February 28, 1984, on the eve of the match vs. West Germany, Captain Eric Gerets was interrogated and admitted to bribery for the May 8th, 1982 match vs. Waterschei. On February 29, 1984, Roger Petit and Raymond Goethals both resigned. On March 1st, AC Milan sacked Eric Gerets. On April 2nd, 1984, the Belgian Federation (Union Belge de Football) announced its punishment. Raymond Goethals and Roger Petit were banned. Eric Gerets was initially suspended for three years however it was reduced to two years on appeal and was eventually rescinded on early 1985. Arie Haan was acquitted and had maintained his opposition to the arrangement. These suspensions dealt a heavy blow to the national team, as Gerets and Meeuws were integral parts of the National team especially of its strongest point, the defense. While Vandermissen and Plessers were also part of the National team set up. Guy Thys had to run against the clock to assemble a decent squad for the Finals. To make things even more difficult experienced defender Michel Renquin had to withdraw from Belgium squad to help his Swiss club Servette in the championship playoffs due to take place during the Finals Tournament. These defections/suspensions earned opportunities to some players who otherwise might not have been deemed ready for an official tournament. Anderlecht had launched a number of young players that season. Defender Georges Grun had stepped up and was called as a replacement for Renquin. More importantly, Italian born teenager, Enzo Scifo had burst on the scene with Anderlecht. Just days before the Finals, his citizenship application was approved. Others such as Anderlecht’s Walter De Greef and Beveren’s Paul Lambrichts also earned spots on the Final roster. Jan Ceulemans was promoted as Captain in the absence of Gerets and would retain it until the end of his National team career. With this far from solid squad, it was a surprise that Belgium won its first match vs. Yugoslavia at Lens on June 13, 1984 by 2 to 0, with goals by ErwinVandenbergh and Georges Grun. However, as it later became apparent, this was more a reflection on Yugoslavia’s poor state rather than on Belgium’s strengths. The next match vs. Hosts France on June 16th at Nantes proved to be the lowest point of this Belgium team and perhaps of this Belgian generation. They were simply overpowered by Platini who scored a hat trick and were defeated by a lopsided score of 5 to 0. This was Belgium’s heaviest defeat since also losing 0 to 5 to Holland during the 1976 European Championships Finals on April 25, 1976. The once rock like Belgian defense had many holes without the guidance of Gerets and Meeuws. Belgium still had a chance to qualify had they beaten Denmark in their next match on June 19th at Strasbourg. However, after going ahead 2 to 0 by goals from Ceulemans and Vercauteren, they were defeated 3 to 2 to a Denmark side containing many Anderlecht players. This Tournament brought Belgium down to earth and Guy Thys knew that serious rebuilding needed to be done if Belgium had any hopes of qualifying the for the 1986 World Cup in Mexico. This year of 1984 ended in disastrous fashion when Belgium was defeated in Albania 0 to 2 in a World Cup Qualifier. Such a result would have been unthinkable just a year earlier. The only bright spot for Belgium had been the discovery of Enzo Scifo who many predicted a bright future. As far as the banned Standard players were concerned: Poel, Vandermissen and Preud’homme had chosen to remain with Standard Liége and serve their suspension. Raymond Goethals started to resurrect his coaching career by managing Portugal’s Vitoria Guimaraes. Many of the banned players left and were able to play in the middle of 1984/85 season. Jos Daerden, Walter Meeuws and Simon Tahamta joined Holland’s Roda JC Kerkrade, Ajax Amsterdam and Feyenoord respectively. Gerard Plessers joined West Germany’s SV Hamburg. Captain Eric Gerets joined Holland’s MVV Mastricht. Due to perhaps lack of match fitness Thys did still not call them upon for the spring 1985 World Cup Qualifiers. However, by the fall of 1985, Gerets was back in the National team to strengthen the defense. By now he had joined top Dutch outfit PSV Eindhoven to rebuild his shattered career. Walter Meeuws was never called up again by Belgium and retired in 1987 and turned to management. After a difficult series of Playoffs with neighbors Holland, Belgium qualified for the Mexico World Cup, where they surprisingly finished in the fourth place. It was a testament on Guy Thys’ ability to instill confidence on a broken team. The Scandal severely weakened Standard Liége and they did not win another League title until 2008, 25 years later. Gerets was able to have a successful playing career at PSV Eindhoven and has had a solid coaching career since. He never regained the Captaincy because of the scandal, despite earning his way back to the National team. Walter Meeuws was surprisingly appointed National Team manger in 1989, though he was sacked within less than a year. Goalkeeper Michel Preud’homme joined Mechelen and was actually elevated as Belgium’s Number one goalkeeper following Pfaff’s retirement and was even named as 1994 World Cup’s best goalkeeper and then joined Benfica. Raymond Goethals managed for many more years and led Olympique Marseille to Champions League glory in 1993. This scandal is a distant memory now and most fans may not even remember those involved, nor care, since there have been many other Football scandals in most European countries in one form or another. For all those involved, besides Roger Petit, luckily their careers were not damaged beyond repair and were all able to stay in the game in some capacity.